In the fall of 2009, Cabaret Rhizome signed a mutual collaboration agreement with the Society of Estonian Magicians. This means that as of September, Cabaret Rhizome offers magic shows in their cozy cellar theatre once every month. The theatre accommodates 35 viewers, so the public can be very close to the magic. The series of shows was opened with a magic show by Aivar Minumets and Fred-Erik Johanson for children and those young at heart (magic lovers of all ages were welcome to attend, of course). These magicians from the Society of Estonian Magicians who are specialized in children’s magic made the day unique and mystical for children on two consecutive Sundays in September (the 20th and 27th) at 2pm. The show included musical sketches, traditional magic, as well as teaching the children a few exciting tricks. There was lots of humor and laughter throughout the show. The show was suitable for the entire family and children of all ages. Thanks to great interest among the public, four repeat shows were held in February 2010. Children visited Cabaret Rhizome again on the 14th, 21st, 27th and 28th at 2pm. 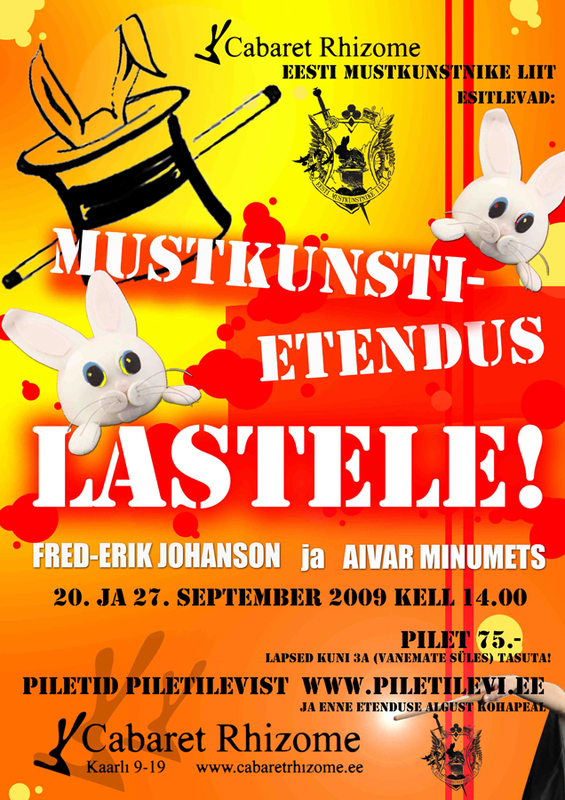 Mustkunstnik teeb puhast tööd – Hea Laps, 10.2009. Cabaret Rhizome täidab sügise tipptasemel mustkunstiga – Elu24, 20.09.2009. Regulaarsed mustkunstietendused Cabaret Rhizome`s – LOMM, 19.09.2009.